Work is still booming and the hours are pouring in. 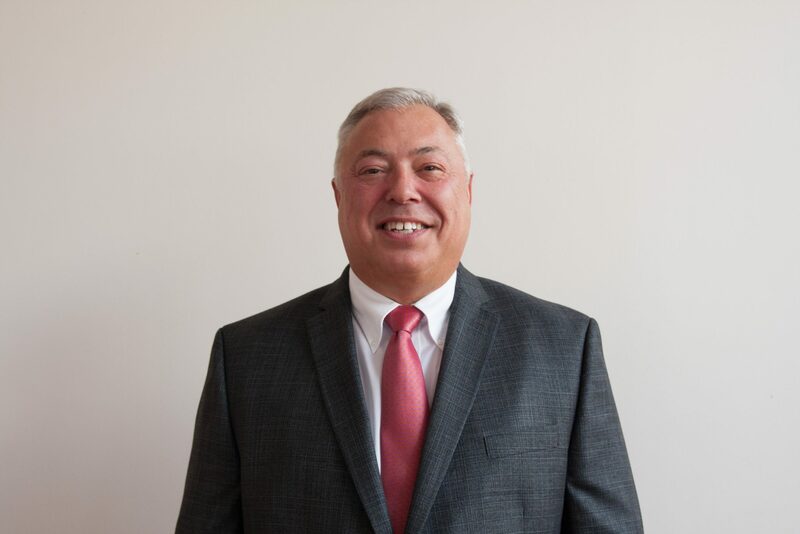 I recently sat in on a corrective meeting for a contractor that was not meeting the standards of the Boston Plan, and an official with the City said they still see three to four more years of solid construction in Boston. Some of those projects have already started, with more scheduled to begin soon. A few examples: Hub on Causeway, 35 Lomasney Way, Bullfinch Crossing, South Station Tower, Washington Square, Tremont Crossing, 1 Post Office Square, 115 Winthrop Square and all the ongoing buildings down at Seaport Square. These are just the larger projects in Boston. Add in Cambridge and the greater Boston area and we are indeed in a sweet spot for the foreseeable future. 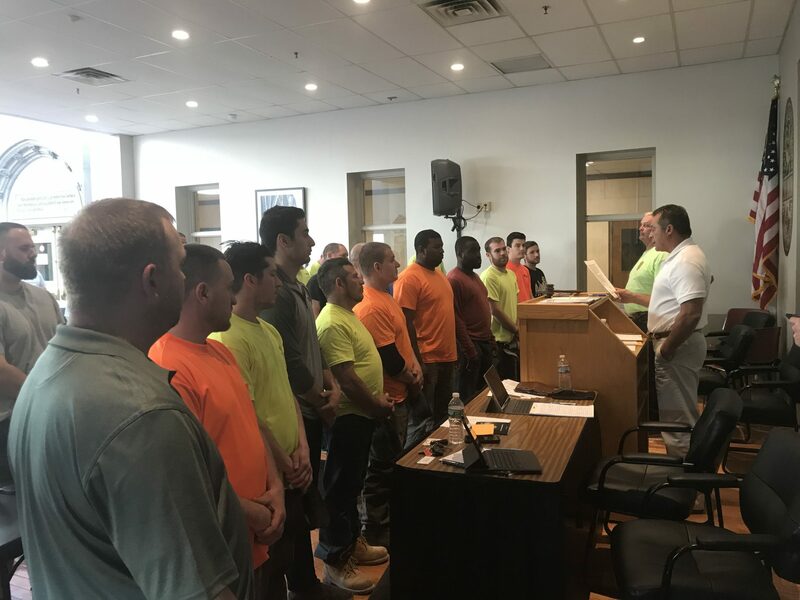 New Glaziers getting sworn in at the Local 1044 meeting. 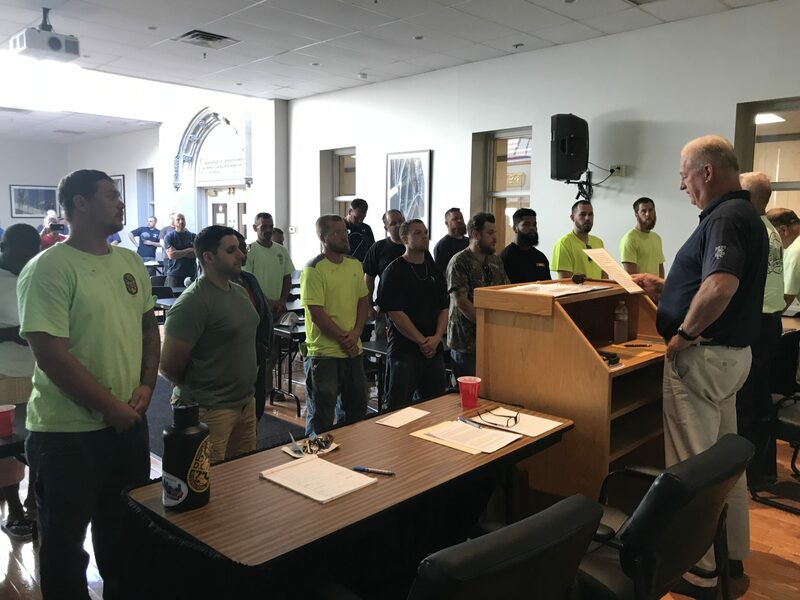 Local 1044 continues to grow through Organizing and Apprenticeship. I attended the apprentice graduation held at the Cathay Pacific in Quincy. I was blown away by the young men and women who have chosen to become tradespeople. I love meeting the kids who stuck it out and now are on the cusp of being productive members and leaders of our union, while earning good wages and benefits on top of it. Our apprentices seem to get better and better each year and it should give us all great hope for the future of this district council. I must also commend the instructors of the F.T.I. on the terrific job they do. It’s wonderful to see. 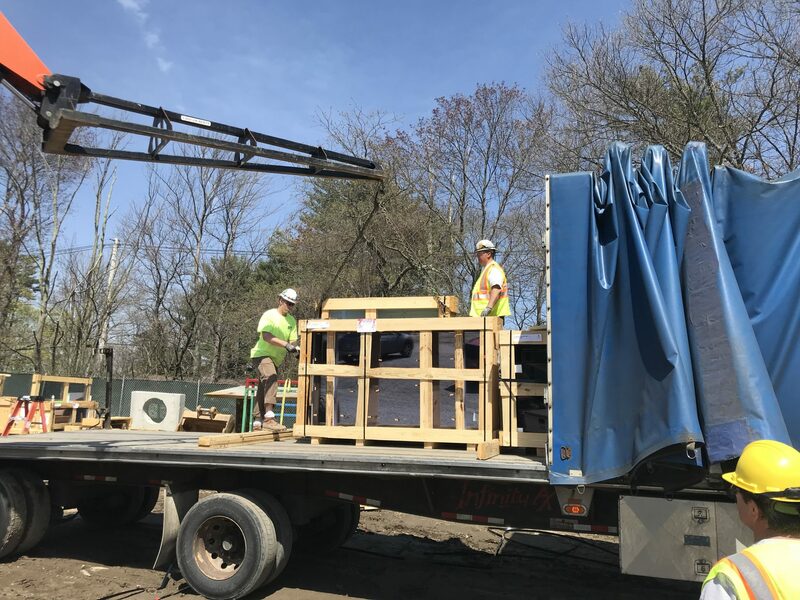 Glaziers for Ipswich Bay Glass unload glass cases at the Siemens project in Walpole. I also attended the recent retiree’s luncheon held at the district council. It seems there are more retired members showing up each time and it’s a hell of a lot of fun hearing the stories and seeing them all again. I’ve always appreciated the fact that these men and women helped build this union into what it is today. Any way we can give back to them is a blessing. They earned it. 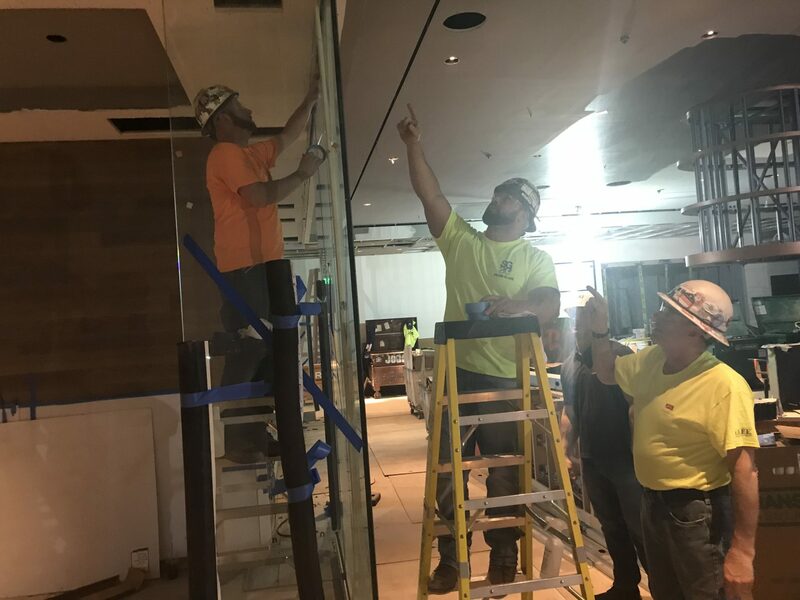 Glaziers from Salem Glass install glass wall at Del Frisco’s. Pictured: Kevin Walsh, Bob Brissette and J.P. Joakim. I am also proud of the fact that as a trustee we were able to increase our pension accrual rate by $10. For a member with 30 years, that adds up to a $300 a month increase. Your union trustees worked hard on this one behind Business Manager Jeff Sullivan. We have also been making continued improvements to the Health & Welfare Plan. Jeff has a great philosophy on the H&W and every time we can save the members money we’ll do it. 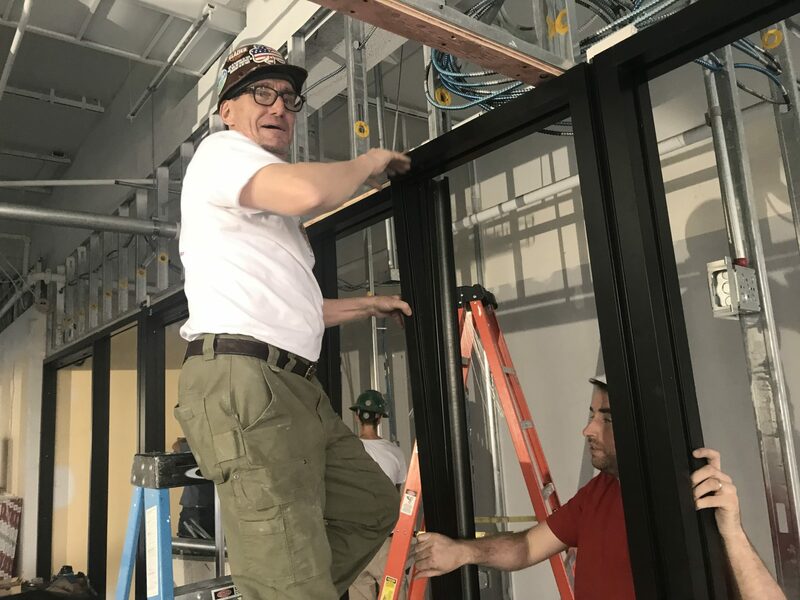 Billy Doyle installing Kawneer frames at the Boylston Street WeWork.  I want to take the time to congratulate the officers of Glaziers & Glassworkers Local 1044, my home local, as well as all the officers, new & old, of all our DC35 locals. Local elections are always exciting, especially when some new blood gets in. We need our members to be involved in their locals and their district council. A lot of great ideas come out of union meetings and it’s important to attend as many as possible. I always say there are no stupid questions, only stupid answers. Asking tough questions of your leadership makes us stronger and I know the entire DC35 staff will answer all the questions they can. Remember, nobody wins unless everybody wins. 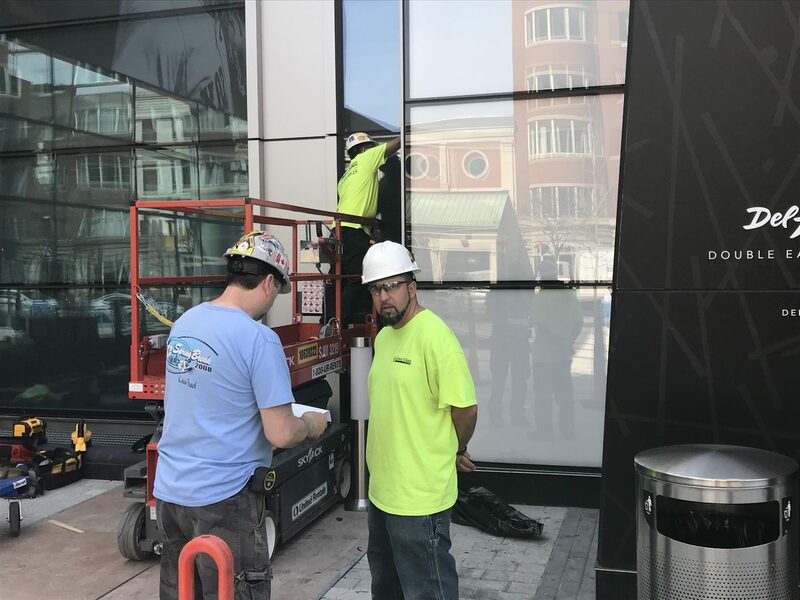 Jackson Glass performing curtainwall repair at 888 Boylston Street.